Cunard ocean liner R.M.S. Franconia, 1913. Sometimes I have to pinch myself when I look at these photos of my great-aunt Benita in Europe and realize they were taken exactly 100 years ago. After finishing her studies at the Art Institute of Chicago, Benita’s parents, Thomas and Mary Jane (Gaffney) McGinnis, sent her to France and Ireland to enrich her appreciation of art and her Irish heritage. Benita had long been fascinated by her father’s stories of his travels around the world as a youth. Thomas McGinnis, who was orphaned at a young age, had run away to sea to become a sailor, seeing much of the world before settling down as a family man. He and Mary Jane spent long hours with Benita, planning her trip and writing to their Irish relatives of her impending arrival. As respectable young women of that era did not travel alone, she went accompanied by her friend Katharine Cronican, and possibly with a cousin, Eileen Kelly (whose name appears on the ship’s manifest on the way back home). 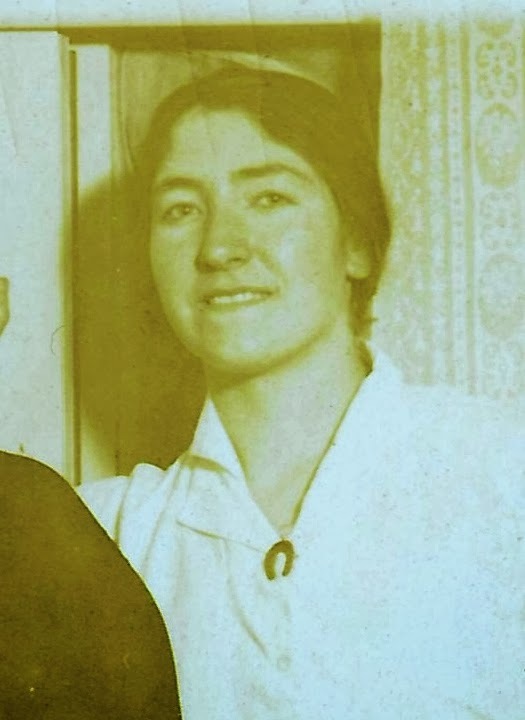 This is a photograph of Eileen Kelly, taken with the McGinnis-Gaffney family at their Drexel Avenue home. Though I do not have any information to corroborate her family relationship yet, I believe she may be related through Mary Jane’s maternal line. I am unable to determine when the three young women departed for Europe, but I know they returned to the United States through Boston on the Cunard liner, the R.M.S. Franconia. They could have been away for as short as the summer of 1913 or as long as a couple of years. wearing sunglasses. The other passengers are unidentified. At sea, 1913. 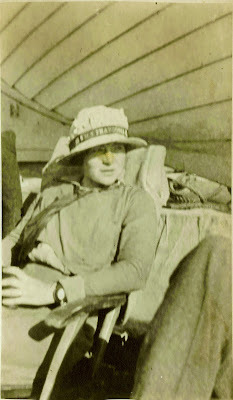 Benita’s scrapbook is crammed with small 2″ x 3″ photographs of her days on ship. Here, she and Katharine hold court with some of their fellow passengers. It is hard to tell whether Eileen is in this group. We have limited information about Katharine Cronican. 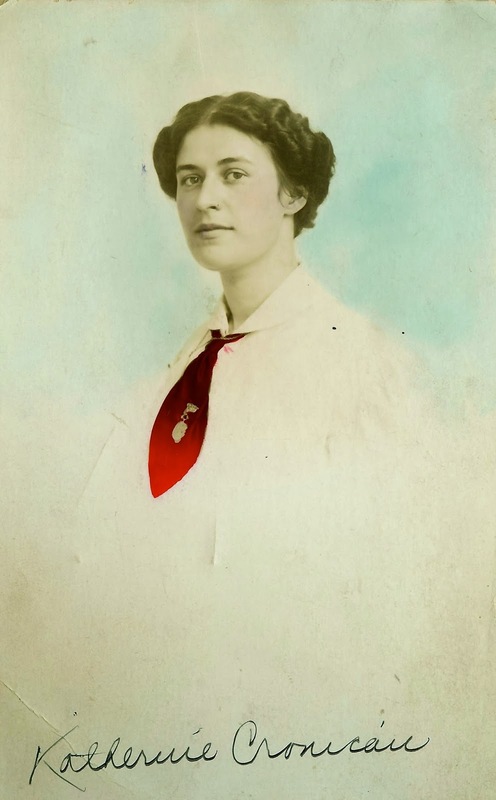 From what I can tell on Ancestry.com, she was born on August 11, 1885, in Valparaiso, Indiana. Her 1910 passport application indicates that she was a teacher living in Chicago who planned to spend two years abroad. A couple of years after returning to Chicago, she married Joseph Marcinkevich, a Russian immigrant who was a soft drink manufacturer. The 1920 U.S. Census lists them as living on East 72nd Street, living with two sons. A couple of years later, Benita and her family would buy a house around the corner on South Vernon Avenue. 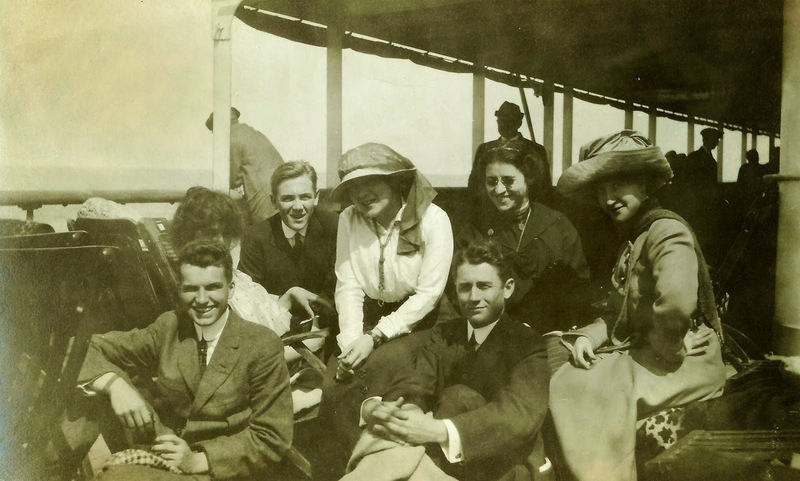 It would be nice to think the two families continued their friendship through the years, with Benita and Katharine reminiscing about their adventures as young Americans in early 20th century Europe. A defining moment in young Benita’s life, this would be the first of her many trips around the world. What an adventure that must have been for the young women! I hope you are able to find more family connections for Benita and her cousin Eileen…although I commiserate with you over having to research a surname like Kelly! Best wishes for a bright New Year, Linda! Thanks, Jacqi! Not quite sure where I will start, but it may have to wait a while. A future project, perhaps? Happy New Year to you and yours!